China will reach ‘peak coal’ for its electricity as soon as 2015 as it shifts toward more affordable and less carbon intensive energy options, according to Professor Ross Garnaut. Speaking at the Melbourne Sustainable Society Institute last week, the senior economist and former federal government climate change adviser predicted the shift will dramatically improve global chances of reaching the internationally agreed 2 degree target to combat the worst impacts of dangerous climate change. The move away from coal will mean a radical ramping up of low-emission energy sources including solar, hydro, wind, gas and nuclear – leading to a “dramatic de-coupling” of coal from Chinese economic growth, said Professor Garnaut. Meanwhile, advances in solar technology are rendering it the fastest growing sector at present – with solar generation capacity having improved by over 140 per cent in the period between 2012 and 2013. Innovations in solar technologies continue to ramp up globally. 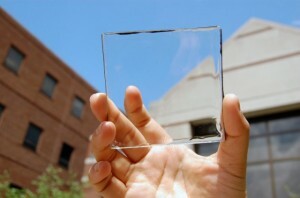 A team of researchers from Michigan State University has just developed a new ‘transparent solar cell’ that can be placed over windows to create solar energy while not blocking peoples window views. According to Assistant Professor Richard Lunt from MSU’s College of Engineering, the solar harvesting system uses small organic molecules to absorb specific non-visible wavelengths of sunlight. The infrared light is directed to the edge of the transparent plastic where it is converted into electricity using ultra-thin strips of photovoltaic cells. “We can use these materials to pick up just the ultraviolet and the near infrared wavelengths that ‘glow’ at another wavelength in the infrared. Because the materials do not absorb or emit light in the visible spectrum, they look exceptionally transparent to the human eye,” Lunt said in a report from Science Daily. However, closer to home, Australian companies in the renewable energy sector are warning that the Federal government’s current policy settings threaten to dramatically damage their business models. “For companies like Dyesol in the process of commercialising renewable energy technology, the government’s stance does not send a positive message to investors here or overseas and puts in jeopardy years of inventive enterprise,” said Richard Caldwell, Managing Director of Dyesol, a Canberra based solar enterprise. Moves to scrap the renewable energy target (RET), abolish the Clean Energy Finance Corporation (CEFC) and the Australian Renewable Energy Agency represent irresponsible policy that deal a serious blow to Australia’s fledgling renewable energy sector. Caldwell called on the Australian government to show leadership by supporting the existing Australian renewable energy sector by maintaining the RET which has the potential to secure our energy future, reduce emissions and make electricity more affordable to all Australians. ← Where are all the fresh, new voices of Australian queer theatre?